xn + yn = zn. This equation does not have any non-zero integer solutions for n>2. By now, this is known for certain; it is no longer an open question. But even if you have a very, very large monitor, the margins of this review would not be large enough to contain the recently discovered proof. Fermat’s Last Theorem is probably the most familiar question in number theory. Throughout history, many mathematical riddles captured the minds of amateurs and master mathematicians alike. Several of these riddles are still open questions, some of them for a very long time (Goldbach’s Conjecture, for example). But Fermat’s Last Theorem had something very special to it: it was a challenge that one man, an accomplished mathematician -- “Price of the Amateurs”, as he is sometimes called -- announced that he had solved. And not only this, but Fermat claimed that he had a “truly marvelous demonstration of this proposition”. Only the margin, on which this observation was scribbled, was too narrow to contain that proof. Mathematicians are known to be notoriously meticulous people. A proposition that has no proof will only be called a “conjecture” until a proof is found and is generally accepted. Only because of Fermat’s reputation, the famous proposition was entitled “Theorem” -- even though no proof of it was known. And so for over three centuries, professional and amateur mathematicians alike kept hunting for the elusive proof. And finally, in October 1994, Professor Andrew Wiles from Princeton University published a proof that survived the scrutiny of his peers and became an accepted formal proof to the known problem. Fermat’s reputation was cleared: the proposition is indeed correct. I have discovered a truly remarkable proof of this, but I can't write it now because my train is coming. In his proof, Wiles used the latest mathematical techniques, much of them discovered long after Fermat’s death in 1665. The story of the riddle and its solution ranges over 358 years, and involves nearly every major mathematician of that period. Thus the result is a real historical saga. Singh’s book unfolds a fascinating, intriguing story, involving many colorful characters and fascinating anecdotes. 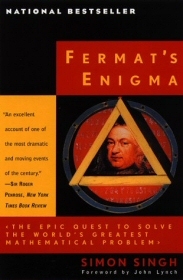 However, despite the great plot, Fermat’s Enigma includes several disappointments. The first, and foremost, one is the book’s dealings with mathematics. There are two different ways to tell such a story: either forsake the mathematics completely, focusing on the people and the saga only; or include enough details to satisfy the mathematically curious reader. Surely, considering the nature of the “detective story”, the latter option is preferred. Singh chose an unsatisfactory compromise, sadly close to the first option. Naturally, I did not expect a full description of the proof -- they say that only a very small part of the worlds' mathematicians can understand it -- but I think most readers will find Singh’s assumptions about their mathematical understanding to be insulting. When writing such a book, one can safely assume that most readers will have at least some mathematical inclination. Repeating the definition of “prime number” more than once is ridiculous. An extreme case of Singh’s insistence of “shielding” the reader from mathematical concepts is his treatment of the idea of induction. A nice metaphor, that of toppling domino pieces, is provided, but from that point on, Singh insists on speaking in terms of domino pieces only, avoiding the word “induction” like fire. The ten appendixes slightly compensate for this attitude towards elementary math, with detailed proofs of some simple concepts (for example, why the square root of 2 is an irrational number). Many readers, however, will find most of these appendixes to be horribly trivial. Another shortcoming in the book is that in his eagerness to provide supplementary details, Singh sometimes drifts to utterly irrelevant territories. Computers, for example, played an extremely minor role in Wiles' proof of Fermat’s Last Theorem. And yet the book devotes about ten pages to an introduction to the history of computing, including a short life account of computing pioneer Alan Turing. While a fascinating read, this hardly has anything to do with the issue at hand! More relevant details are often left out. Most noticeably, after reading the book, the reader will find out that he knows surprisingly little about the life of Andrew Wiles, he who provided the glorious solution. With the solution to Fermat’s Last Theorem, Wiles sealed an era in the history of mathematics. However, it is clear that Fermat’s proof was not even remotely similar to Wiles'. As noted, Wiles used the latest mathematical techniques, much of them discovered long after Fermat’s death. His main contribution was proving a theorem known as the Taniyama-Shimura conjecture (or, now that it was proved to be true, the Taniyama-Shiumra theorem). That theorem was first suggested in the middle of the twentieth century. So there are really two options: either Fermat never did solve the problem -- he only thought he did. Or else his proof was so marvelous that nobody, for over three centuries, was able to reproduce it. Today’s mathematicians are divided by this question. If you think Fermat’s real proof is really out there, you still have a chance at world fame: go ahead and find it. Another option for achieving eternal recognition is solving any of several other mathematical riddles that are still open questions. In the last chapter of Fermat’s Enigma, Singh provides a list of the more famous of these problems. Some of these, he hints, could possibly be solved using smart computer algorithms. Hackers of the world, take note: here is your chance to fame and glory. You should try out Petr Beckmann A History of Pi, which is more of a history of mathematics in general, and a great read.